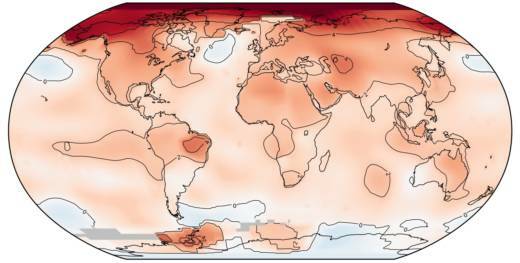 For three years in a row now, our Earth has experienced record high temperatures. On Wednesday, NASA and the National Oceanic and Atmospheric Administration announced that globally, 2016 was the hottest year since modern record keeping began in 1880. It follows 2015 and 2014, which were the previous highs. The top five hottest years have all been in the 21st century. The 2016 average global temperature was 58.69 degrees—0.07 degrees above the 2015 global average. And the difference is even bigger when compared to the last century. During 2016, the average global temperature was 1.69°F above the 20th century average. Several places also reported historic high temperatures. New Zealand, India and the Arctic all experienced record warm years in 2016. For the U.S., 2016 was the second warmest year on record. In California, 2016 was the third warmest on record at 2.8°F above the mean of 57.4°F. Scientists say no land areas were cooler than average during 2016. And the top five hottest years—2016, 2015, 2014, 2010 and 2005—all happened in the current century. Most of the warming is due to greenhouse gases like carbon dioxide that trap heat in the atmosphere. Only about 10 percent, during 2016, was attributable to El Niño, according to the scientists. Worldwide, many nations have set a goal of keeping temperatures from rising 1.5°C above pre-industrial levels, to stave off the worst effects of climate change including floods, droughts, storms, and heat waves. "How quickly we get to 1.5, that's really a question of how much carbon we keep emitting," says Gavin Schmidt, director of NASA’s Goddard Institute for Space Studies. "We're closer than we'd like to be." Right now we're only .4 degrees away, according to NASA. The Earth’s average global temperature has risen about 1.1 degrees Celsius since the late 19th century. As for 2017—it'll be another warm one. Schmidt says because of La Niña it'll likely be cooler than 2016. But he predicts 2017 will still make the top five in terms of record-breaking global temperatures.